*Disclaimer: Product received from Cold Brew Kitchen in exchange for review. Opinions in this review are my own and are not influenced by compensation. “But first, coffee!” said everyone, ever… save for any freak who doesn’t drink coffee (just kidding, I love you). But seriously–if you’re a coffee aficionado like myself, a hot cuppa is the first thing you think of when you stir in bed at the crack of dawn. In fact, it’s probably the driving force that gets you out of bed. Coffee is a purpose; coffee is a gesture of friendship and appreciation; it sits beneath happy conversations and tough discussions. Coffee is the beginning mark of every road trip. To a coffee lover, coffee isn’t a caffeinated beverage–it’s a state-of-mind. But let’s face it: even some of the most loyal coffee lovers will admit that when they need a pick-me-up in the late afternoon of a hot summer, a cup of hot coffee leaves much to be desired. Along with the extra zap of energy, you long for something cool and refreshing; you want ice cubes sloshing around in your cup. You’re probably familiar with iced coffee since it blew up in North America in or around 2009. Legit iced coffee is set up to drip onto ice cubes which cools the brew instantly. Iced coffee also maintains the acidity of fresh coffee. Cold brew coffee is steeped in the fridge for 12-24 hours and, during this process, the acidity levels are reduced making it less harsh on your stomach lining. It also reduces acid reflux. So, if you suffer from digestive issues that prevent you from enjoying the nectar of the Gods, this could be the answer to your prayers. Because of the steeping process, some believe that cold brew coffee is intended solely for those who plan ahead. After my experience, I completely disagree. Cold Brew Kitchen makes it easy. All you need is a 12 oz package of Cold Brew Kitchen’s coffee grounds, a glass pitcher, a steeping cloth (which comes free with your online order from Cold Brew Kitchen), and a whopping five minutes. You can make a large quantity of coffee at once and the best part? It keeps in the fridge for 7-10 days (though no coffee would last that long in my presence). The freshly brewed flavor carries out until the end. It’s a time saver, if anything. 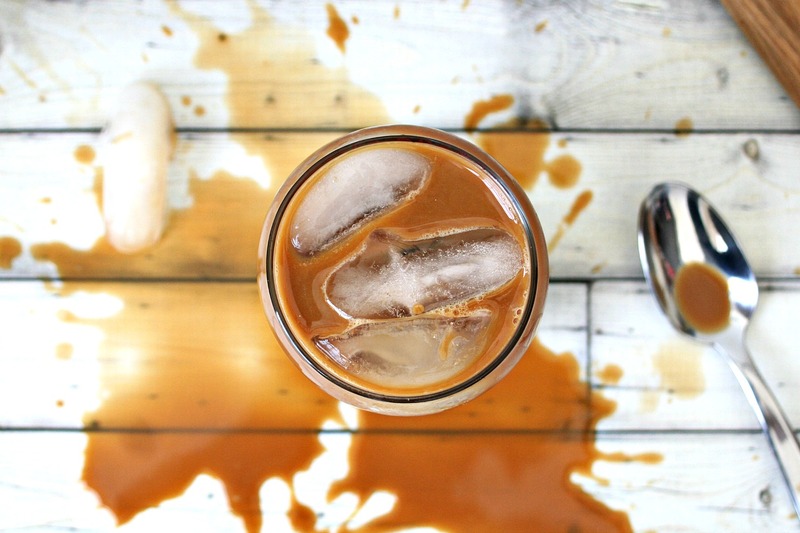 Way less work than perfecting an iced coffee brewed over…ice. I was sent a 12 oz bag of the Cold Brew Kitchen Reserve Blend–100% Arabica beans, Artisan roasted in USA, Roast level 3/6. Empty the 12 oz bag of grounds into a glass pitcher. Add 7-10 cups of water. Filtered water will result in a better flavor. I went with 8 cups of water for my brew. Give it a good stir to ensure all of the grounds are soaked. Place the pitcher in the fridge for 12 to 24 hours. When it’s go time, get another pitcher ready and place your filter bag over/into the new pitcher. Pour the coffee blend into the filter. Squeeze the filter bag tightly to release all of the concentrate into the pitcher. Do this until you’ve squeezed out all of the liquid, because you want as much coffee out of this as possible, of course! Serve 1 part coffee with 1-3 parts milk, creamer, almond or soy milk, etc. and whatever fixings you prefer. I’ve gotta say, this is a delicious and beautiful thing. This is absolutely something I can see myself enjoying this summer. I can hardly wait to enjoy my next glass tomorrow afternoon! Food blogging full time requires a lot, and I mean a lot, of focus. I think sipping a glass of cool curated coffee will help keep me on my “A Game” during North Carolina’s dog days this summer. Reviewing this product came at a perfect time. Two thumbs up from this coffee lover! For more information, visit www.coldbrewkitchen.com. Don’t forget, when you order directly from the site, you get a free handy filtering bag with your order! Cold Brew Kitchen is also on Instagram, Twitter, and Facebook! Follow them for updates. YUUUUUUUUUUM. I love cold brew + almond milk! I make mine in big mason jars that I keep rotating in the fridge. Coffee doesn't last long around here, either. PS - super cute coffee glasses!